The 2012 SEEDS Report of Progress last month won first place in the Production/Digital Color category in a competition held during the annual conference of the Association of College and University Printers. 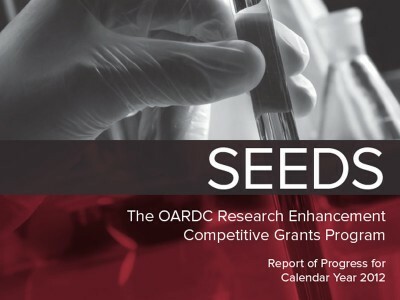 Published by OARDC's SEEDS competitive grants program, the report was entered in the competition by Gary Warren of CFAES Communications, who attended the conference. Contributing to the project in addition to Gary (digital print) were Lauren Farr (graphic design), Kim Wintringham (editor) and Ken Chamberlain (photography), all of CFAES Communications, and Sarah Elvey and Lori Kaser (compilation and oversight), both of the OARDC Director's Office.